born in that country in the year 1865, and he is the son of Albert and Anna Novacek. Our subject grew to his second year in his native land, and in 1866, with his parents, came to America, as did so many of the sturdy sons of foreign shores in those early pioneer day. The family, including our subject, sailed front Bremen, Germany, to Baltimore, and after landing in the new world immediately started for Chicago, stopping there until the fire of 1871. In the fall of that year the family removed to Jones county, Iowa, and, in the spring or 1872, returned to Chicago for the summer, then back to Jones county, where they lived until 1889. They then came to Knox county, Nebraska, where they took up a homestead in section seven, township thirty range seven, which remains the old home farm to this day, and where Mr. Novacek now resides. He has improved the land until he now has a fine farm and good home, where he is surrounded by his family and a wide circle of friends and acquaintances. In September, 1910, Frank Novacek bought one hundred and fifty acres of improved land in Sparta township, two and a half miles north of Verdigris. He intends putting a son and daughter on the place. In 1891, Mr. Novacek was united in holy matrimony to Miss Fannie Skliskey, and they are the parents of four children, whose names are as follows: Albert, William, Anna, and Mary, all of whom are living under the parental roof. Mr. and Mr. Albert Novacek are till [sic] living and reside on the old homestead. Through eceptionally [sic] good management and persistent labors, the gentleman here named has acquired a well developed farm and is enabled to enjoy the comforts of modern farming. He is of a progressive nature, and has a wide eperience [sic] in farming. Mr. Kammer's pleasant home is located in Herick county township, on section twenty-eight, township thirty-two, range three where he and his family reside, surrounded by a host of good friends and many acquaintances. Mr. Kammer was born in 1860, and is a native of the state of Iowa. He is a son of William and Hannah (Linney) Kammer, both natives of Germany, coming to America and settling in Clinton county, Iowa state, in 1856. Our subject was born on a farm, and here he remained with his parents, assisting with the work and attending school, receiving a good education. In 1894, Mr. Kammer came to Knox county, Nebraska where he bought one hundred and sixty acres of good land and improved same until now he has a fine farm and home. Mr. Kammer was united in holy matrimony in 1882 to Miss Ella Stevenson, and Mr. and Mrs. Kammer are the. parents of two fine children, whose names are as follows: Roy J. and Earl V.
Mr. Kammer has been identified with the history of Knox county from an early date, and has always taken an interest in the welfare of his home county and state. Fredrick Schilling, a well-to-do farmer, energetic and industrious, a typical representative of the German race, who came to this country to establish a home and accumulated a competence for himself, resides on his fine farm in section two, township twenty-two, range one, west, Madison county, Nebraska. Mr. Schilling has resided in Madison county for the past thirty-four years, which places him well along in the ranks of the oldest settlers of this region. Since coming here, Mr. Schilling and his father before him have always taken a leading part in everything pertaining to the best interests of their home state and county. Mr. Schilling resides in Union precinct, and he and his family are surrounded in their pleasant home by a host of good friends and neighbors. Mr. Schilling is a native of Germany, his birth occurring in Prussia province, January 13, 1862; he is a son of Gottlieb and Wilheimena (Prusz) Schilling. Our subject grew to early manhood in his native land, and in 1876, he, with his parents left the old country for the new world, sailing from Hamburg, Germany, to New York in a steamship. After landing in the United States, the family went west, remaining in Omaha, Nebraska, one week. They then came on to Madison county, where they bought the right to a homestead for two hundred dollars, and built a shanty twelve by sixteen feet, living in this several years. Mr. Schilling later bought his present farm of three hundred and twenty acres, and has steadily improved same until he now has a good farm and pleasant home. In those earliest years of settlement on the western frontier, our subject and the family experienced many severe hardships and discouragements and not the least of the dangers to contend with were the prairie fires that often swept over the open prairie leaving havoc in their wake; and many times were our little family compelled to fight this danger to save their lives and homes. Columbus, many miles distant, was their nearest market place in those times, and the journey consumed many days in going to and fro. Mr. Schilling's father nearly lost his life in the blizzard of January 12,1888. Mr. Schilling was married in 1892 to Miss Wilhemena Brummond, and they are the parents of four children: Paul, Mattie, Clara, and Martha. They are a fine family. A. J. Leach, an enterprising and substantial citizen or Oakdale, Antelope county, Nebraska, is one or the men of whom the people of Nebraska the surrounding community are justifiably proud. He is a typical pioneer of Nebraska and is prominently known throughout the state with which he has been identified so many years. Mr. Leach has contributed in every conceivable way to the advancement and growth of his home state and county, and among other contributions, wrote the history of Antelope county as it was in its very first days of settlement. He has been a part of the growth and development of this region and has built up for himself a substantial home and fortime by his perseverance and thrift, and has come to be one of the foremost citizens of Antelope county. Mr. Leach is a native of Cuyahoga county, Ohio, born September 19, 1834. His father, was a native of Vermont, where he was born in 1796, and after growing to manhood served in the war of 1812; he died when the boy was but seven years of age. Both of Mr. Leach's grandfathers served in the revolutionary war, Grandfather Huntington was captured at the battle of Long Island and was in the prison ship at New York. His ancestors came from England, but were of Scotch descent, on the father's side, having gone to England about the year 1300; they came to America from the north of England in 1629, seven generations ago on the father's side. Mr. Leach's mother who before her mariage [sic] was Miss Theoda Huntington, was born in 1800 in Vermont, of English descent. In 1834 the family moved from Ohio to Michigan, and remained there two years, returning to Ohio in 1836, and then to Michigan in 1842. In 1852, Mr. Leach, with his, cousin, bought a pony on which they packed baggage; they walked to La Salle, Illinois, from there to St. Louis, by way of the Illinois and Mississippi, rivers, where they bought supplies. Coming up the river by steamer to St. Joe, where they hired out to drive ox teams across the prairie, then started up through Nebraska, then on west to the coast, and to Oregon. They remained there six years and returned by way of Isthmus of Panama to the state of Michigan. In 1867 Mr. Leach came to Omaha, where he resided eleven months, filling the position of clerk in the hardware store of E. J. Cook. In the spring of 1868 went to Dodge county, and then came to Antelope county in the year 1869, and took up a homestead claim in section two and three, township twenty-three, range six, in what is now known as Cedar township; here he built a double log house, each part, being sixteen by sixteen. During his residence in this location, Mr. Leach suffered hardships and losses of every description; grasshopper raids, every form of storm, wind, hail; and one of the most persistent and dangerous obstacles to be met in those days was the prairie fires, which had to be almost constantly fought to preserve home, property, and lives. But these events have long since passed to history, and Mr. Leach now lives to enjoy the peace and prosperity which prevails in the present day. Mr. Leach was united in marriage December 28, 1858, to Miss Esther E. Hill, and Mr. and Mrs. Leach are the parents of six children, namely: Miles H., married to Blanche Mallory, who lives in Raymond, Washington, they having two children; Dewett C., of Antelope county, who is married to Miss Nettie Brainard, and has four children; Katie M., also in Antelope county, wife of C. H. Brainard; Agnes L. who is the wife of Harry Langley, live in Laurel, Nebraska; Carrie E., in Antelope county, wife of V. E. Brainard; and Gertrude, a twin to Agnes, who died when a small child. Mr. Leach is a leader in all public spirited movements, and an organizer of several offices which were created in the first days of Antelope county's settlement. He was the first county superintendent, serving two consecutive terms; he also held the offices of county surveyor one term, and county treasurer two terms. He organized the first sixteenth school districts in Antelope county. Mr. Leach has the distinction of having paid the first taxes to be exacted in Antelope county, which was in 1871, they being paid to Robert Marwood, in April, 1872, and he still holds tax receipt number one. Mr. Leach is now retired, residing in a beautiful home in Oakdale, and enjoys the possession of many acquaintances and staunch friends throughout the state of Nebraska, where his high character is recognized by all. William R. Mattox living retired from active life in Comstock, Nebraska, is honored as a public-spirited citizen, and as a veteran of the Civil war. He was born in Sullivan county, Indiana, August 15, 1848, fourth in order of birth of the children of Benjamin and Elizabeth (Gilman) Mattox. Mr. Mattox has three brothers in Illinois and the others of the children are deceased. The father was a native of southern Ohio, served in the Civil war as a member of Company H, Eighty-fifth Indiana Infantry, and died in Illinois in 1883. His wife died in that state in 1866.
and soon afterward removed with the rest of the family to Coles county, Illinois, where they engaged in farming. He was there married on October 4, 1866, to Miss Mary F. LaRue, a native of Illinois. In the fall of 1884 Mr. Mattox brought his wife and six children to Custer county, Nebraska, homesteading one hundred and sixty acres of land on section thirty-four, township eighteen, range eighteen, which they occupied many years. He brought the place to a fair state of development and productivenesss [sic] and took an active part in local affairs. He assisted very materially in organizing the school known as Columbia school, was the first director on the board, and served in that office many years. Nine children were born to Mr. and Mrs. Mattox, seven of whom are now living: Thomas of Broken Bow, is married and has five children; James W., of Coberg, Nebraska, is married and has seven children; Laura E., wife of William Westbrook, of Dry Valley, has eleven children; Charles B., living near Comstock, has two children; Joseph A., who lives near Broken Bow, is married and has five children; Anna, wife of Fred Neidt, lives near Comstock; Harvey O., of Comstock, is married and has five children. Mr. Mattox and family were among the very early settlers of the region and passed through many stages of Nebraska's history. He became a prosperous farmer and stockman and owns a farm of three hundred and seventy-nine acres, which is well improved and equipped, located one mile south of Comstock. It contains ten acres of fine timber. Mr. Mattox is one of the best known men in the community and it was a great grief to his family and friends when his eyesight began failing. On account of this infirmity he retired from farm work in 1909 and purchased the nice home in Comstock, where he now lives. Fortunately, Mr. Mattox now has a new lease on vision through a successsful [sic] operation on his eyes, and is now able again to take active part in business affairs. On another page will be found portraits of Mr. and Mrs. Mattox. 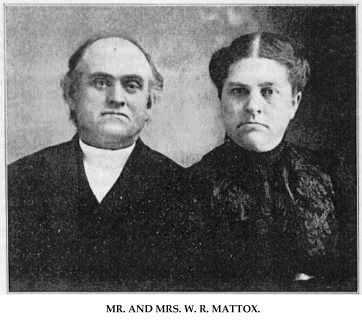 Mr. and Mrs. W. R. Mattox. Isaac A. Coleman is a well-known and prosperous business man of Broken Bow Nebraska, and is much interested in the welfare and progress of his community, being one of the older settlers of Custer county. He was born in Knox county, Illinois, April 9, 1843, a son of John and Sarah (Lambert) Coleman, and fifth of their nine children. He has two sisters in Wisconsin, and one sister in Kansas City, and others of the children are deceased. The father was born in Harrisburg, Pennsylvania, of German descent, and died in Wisconsin, January 28, 1872, and the mother, a native of Indiana, died in Wisconsin, January 1, 1893. In 1847 Isaac A. Coleman accompanied his parents to Jackson county, Wisconsin, and there reached manhood, being educated in local schools. As a young man he engaged in lumbering, and, from the time he was thirteen years of, age assumed most of the responsibility of the family's support, his father being an invalid for many years. On November 8, 1861, Mr. Coleman enlisted at Black River Falls, Wisconsin, in Company G, Tenth Regiment, Wisconsin Volunteer Infantry, served three years, and received his discharge at Milwaukee, in November, 1864. Among the important battles in which he participated were Chickamauga, Lookout Mountain, Missionary Ridge, Tunnel Hill, Buzzard's Roost, Kenesaw Mountain, Peach Tree Creek, Atlanta, besides many minor engagements and skirmishes. While guarding railroads in Alabama he was taken prisoner and held five months and fourteen days, most of the time in Libby prison. Later he became a non-commissioned officer. At the close of the war he returned to his home in Wisconsin and resumed his former occupations. He was married at Black River Falls, May 11, 1869, to Miss Eunice C. Ormsby, a native of Parishville, New York, and in the spring of 1880 he brought his wife and two children to Wayne county, Nebraska. He purchased land and engaged in farming, but two years later sold his interests there and came, to Custer county, where he homesteaded one hundred and sixty acres of land comprising the southeast quarter of section twenty-six, township eighteen, range twenty-two, which was the home place for more than twenty years. He also secured a timber claim of the same size. Mr. Coleman has always been interested in educational measures and other movements for the good of the community and county, and served many years on the school board in district number sixty-two, and for two terms was county supervisor. In 1903 he retired from farm work and purchased a place in Broken Bow, where he erected a pleasant home. He is regarded as an enterprising business man and a public-spirited citizen. He and his wife had three children, namely: Ernest M., in hardware business at Merna, has three children; Alice, wife of L. Van Buskirk, of Wyoming, has two children; Ethel W., wife of Fred H. Ream, of Broken Bow, has one child. Virginia has given many of her sons to the counties of northeastern Nebraska, and one of them who made an honored name for himself was Charles W. Scott, who passed away March 18, 1909. Scott, whose entire lives were spent in the "Old Dominion," and grew to manhood on his father's farm among the Virginia mountains. He was married in this county to Miss America Groseclose, a native of Virginia, and daughter of James and Amanda (Wolf) Groseclose. After his marriage he farmed in his native county until his migration to the west in March, 1883. The first year he rented a farm near Foster, Nebraska, and then filed on a homestead seven miles southeast of Plainview, and eight years later purchased an additional quarter section at Osmond, on which he resided four years. Selling his farms, he moved to Laurel, Nebraska, and kept hotel for four years, when he disposed of his business and retired to Plainview to make his home during his remaining years. But he could not sit idly by, and, until health failed him, he collected and shipped cream to the Kirchbaum Creamery at Omaha. Six children were born to Mr. and Mrs. Charles W. Scott: Laurel Belle wife of Edward Jefferson, a merchant of Osmond; Rachel, who married Lewis Simpson, a banker of Mitchell, South Dakota; Earl, who is in partnership with his brother-in-law, Mr. Jefferson, in Osmond; Andrew, Glenn, and Benjamin, who still make their home under the parental roof. During the memorable blizzard of January 12, 1888, Mr. Scott braved the storm and saved a dozen of his cattle who were drifting away. One of them, an old family cow, knew the voice of her mistress who was calling to her through the blast, and the rest of them followed to shelter, with Mr. Scott in their trail. The excessive hail of 1890 wrought them great damage, beating every stalk of their crops into the ground, and breaking every window in their house as the wind reversed from first, one side of the house to another, pelting the large ice balls as if from a small cannon. Mr. Scott had a hundred and five hogs to be fattened for the market, but when his crops, were all ruined, leaving nothing for their feed, he had to sell them for any price he could get. During the first two years in Nebraska, Mr. Scott's family, in common with all early settlers, had no fuel but twisted bunches of hay. Wood was not to be had in many miles around and coal was scarce and too high in price for early comers. For two years prior to his death, Mr. Scott's health was poor, but he was patient withal. He was a citizen of whom all speak in praise when his name is mentioned. He was of the sturdy type of manhood that has succeeded in developing the wilderness into a teeming, productive land. Mr. Scott was a democrat in politics, a member of the Methodist Episcopal, church, and affiliated with the Ancient Order United Workmen. Frank Bartle, who died in St. Paul, Nebraska, on October 22, 1902, was one of the most prominent old-timers of Howard county. He was born in Rochester, Minnesota, December 6, 1855, spent the first few years of his life in that vicinity, then with his mother and two brothers, moved to Winona, Minnesota, remaining there until he was nineteen years of age, during which time he was employed as a clerk in a wholesale drug house. Mr. Bartle came to Grand Island, Nebraska, in 1874, his first position being as salesman in the mercantile establishment of Samuel Wolbach and Co., which was one of the largest and best known firms in that part of the state, with a branch house in St. Paul. He remained in Grand Island up to 1880, then was transferred to the St. Paul house, continuing with the concern for five years, when he started in the general mercantile business on his own account and carried on successfully up to the time of his death. In 1887 he had the misfortune to lose his store by fire and suffered a severe loss, but he immediately erected a modern brick structure of commodious proportions, and put in a complete line of goods, soon building up a larger patronage than ever in the surrounding country. Mr. Bartle also erected a beautiful dwelling for himself and family in St. Paul, which is still occupied by the widow and children. He was interested in the land business in and about St. Paul, and prominent in every movement started for the betterment of his locality. He was widely known for his upright mode of living, and integrity of character, and no resident of Howard county, has been more sincerely mourned than he. sibilities, and at his death assumed full charge or his business affairs, assisted by her son Edward, who at that time was but sixteen years of age. Mrs. Bartle's mother is still living in Saunders county, at the home of one of her daughters, and at the age of eighty-five years is active and takes a lively interest in all matters pertaining to the farm which she still owns. William H. Predmore, an old and widely known citizen of Custer county, Nebraska, is a large landholder and a prosperous business man. He is a native of Findlay,. Ohio, born March 5, 1844, youngest of the ten children born to Moses and Jane (Cayton) Predmore, the father a native of New Jersey, and the mother of Pennsylvania. Moses Predmore died at Garnavillo, Iowa, in 1862, and his widow passed away at Point Pleasant in the same state, in 1878. Besides William H, there is a daughter, Mrs. Caroline Strother, who lives in lowa, but the other children are all deceased. In 1849 William H. Predmore accompanied his parents to Iowa, where he reached maturity on a farm, being educated in the local schools. Later he engaged in farming on his own account, and being reared to habits of perseverance and industry, has been very successful in his chosen occupation. Mr Predmore was united in marriage with Bertha E. Coslor, in Winneshiek county, Iowa, on March 28, 1865. Mrs. Predmore was born in Germany, a daughter of Jacob and Adeline Coslor, both also natives of that country. Mr. and Mrs. Coslor both died in Iowa, he in 1848 and she in 1856. One son, Augustus, lives at Sargent, Custer county, retired from active life. The family came to America in 1846 and first located in Cincinnati, Ohio, later coming west. Mr. Predmore and wife made their first home in Clayton county, Iowa where he eventually purchased land. In the spring of 1874 he brought his wife and their three children to Fremont, Nebraska, living there ten years. They came to Custer county in the sprng [sic] of 1884 and homesteaded one hundred and sixty acres of land on Middle Loup river. In 1890 they removed to Broken Bow, where they remained about fifteen years. They then came to their present place, which adjoins the city limits of Broken Bow on the west. He had purchased this farm some years prior and in 1903 erected a fine home there. He has a well-equipped farm and has it in fine condition. Three children were born to Mr. and Mrs. Predmore: Adeline M., wife of H. G. Hall, of Sidney, Nebraska, has two children; James W., living five miles west of Broken Bow, is married and has five children; Daniel W., of Custer county, has two children. Mr. Predmore is the owner of eleven hundred and sixty acres of land, all in Custer county, and is well-known as a self-made man. He is an enterprising and patriotic citizen and interested in all measures for the welfare of his county, and state. He is member of the Masonic order and has been so for forty years. In reviewing the history of eastern Nebraska, the citizens who have contributed to the welfare of this section of the state must be given special mention, and a prominent place among this number is accorded to the gentleman above named, and also to his father, Patrick Ragan, who is one of the leading old settlers of this state. Mr. Ragan resides on section twenty-seven, township twenty-one, range one, Madison county, where he and his father are well and favorably known, and enjoy the respect and esteem of all who know them, and their friends are many. R. J. Ragan, our subject, is a native-born Nebraskan, his birth having occurred in Platt [sic] county, May 5, 1882, and he is a son of Patrick and Katherine (Ragan) Ragan, the father being a native of Ireland, where his birth occurred in County Kerry, in 1949. The son received the usual school advantages in his native state, where he has remained all his life, and as far as he knows, always intends to remain, as taking it all in all, Nebraska has treated him fairly well. Our subject's father, Patrick Ragan, left his native land for the new world in 1861, embarking on a sailboat at Liverpool, and landing in Canada, where he remained one year, and from thence came to the United States. After arriving in this country, he came west to Platte county, Nebraska, in 1869, and took up a homestead in section four, township twenty, range one, and on this land put up a sod house and lived in this seven years, later building a good frame house. In those early days on the frontier, the family experienced many hardships and discouragements; the virgin soil. of the open prairie had scarcely known the cut of a plow or the touch of cultivation, and when the family planted their first crops, the grasshoppers came in hordes and devoured every vestage of vegetation to be found anywhere; many times they fought the destructive prairie fires that so often crept upon the early settler unaware, and had great difficulty in saving their lives and property. In strange contrast to the fires which raged round, the settlers found fuel a scarce article and often were compelled to burn twisted hay and cornstalks for cooking and warmth. In those days, Columbus was the nearest market place, the town being thirty-five miles distant, and much time was consumed in making the journey to and fro. Deer and antelope were plentiful then, and were seen in herds grazing throughout the country. now resides, and during his residence here has proved himself to be a substantial and progressive citizen, and with his son enjoys the respect and esteem of all who know them in the community in which they reside. J. D. Gabelman, a prominent farmer and stock man living on section seventeen, township twenty-one, range two, is well-known throughout Madison county, as a progressive and successful agriculturist, highly esteemed by all who know him. Mr. Gabelman is a native of Will county, Illinois where he was born June 11 1857, a son of Jacob and Pheobe (Deed) Gabelman. The father was a miller by trade, and followed that occupation in the old country. Our subject's father came to America on a sailboat bound from Bremen to New York, and was on the sea about forty-two days. After landing in the new world, the father stopped at Rochester, New York, and then proceeded to Illinois state, remaining there a few years. In 1872, Mr. Gabelman, with his parents, came to Nebraska, locating in Madison county, where his father took up a homestead, and on this land built a frame house, fourteen by eighteen feet. Here in the earliest days of settlement on the western frontier, the little family suffered many hardships and privations, as did so many of the brave sons who came to this undeveloped country to brave the unknown dangers and suffering. The grasshoppers took all the crops the first few years the family were in Nebraska, which was very discouraging to them and the few other settlers. Deer and antelope were plentiful in those days, and frequently could be seen grazing about; many times they burned hay and corn stalks for fuel to keep warm by, as wood was too scarce and high in price to think of buying it. In 1877 Mr. Gabelman was united in marriage to Miss Elizabeth Knapp, and to this union nine children were born, whose names are as follows: Jacob, Charles, Fred, Frank, William, Alfred, Myra, Pearl, and Elizabeth. They are a fine family and in their comfortable home are surrounded by a host of good friends and acquaintances, and enjoy the respect and esteem of all who know them. John P. Tackley, a prominent citizen of Custer county, Nebraska, was among the earlier settlers of the state and has passed through various periods or the history of the development of the country from a region of wild prairies to farms villages and cities. He was born in Syracuse, New York, October 7, 1845, fourth of the ten children of Peter and Mary Tackley, both natives of France, but married in America. Both parents died in New York, the father about 1890 and the mother in 1909. They were farmers and their children were reared to farm life and educated in the local schools. Besides John P. Tackley, there are three sons and a daughter in California, one daughter in Chicago, and two sons and two daughters in New York. After leaving school Mr. Tackley learned the trade of cooper, which he followed in his native land and later in Toledo, Ohio, where he located in 1881. He was married in New York, July 26, 1869, to Ellen Delong, a native of that state. In 1883 they removed from Ohio to Custer county, Nebraska, securing a homestead near Anselmo and a timber claim of one hundred and sixty acres. They also pre-empted eighty acres of land. In 1895 they sold their farming interests in Custer county, receiving but thirty-five dollars for the timber claim, and returned to Toledo, remaining there about a year and a half. In the spring of 1897 Mr. Tackley again decided to locate in Custer county and for nine years conducted a store at Gates. In 1907, they came to their present home, at Lillian postoffice, where they have established a general store and enjoy a good custom. Mr. Tackley has established himself in the good opinion of his neighbors and is a man of business foresight and enterprise. He and his wife are wellknown in many circles and enjoy the esteem of a large number of friends. Two children blessed the union of Mr. Tackley and wife: Georgia, wife of William Newcomb, of Custer county, has ten children, and Flora, who married Morton Russell, also of Custer county, and has eight children. Mrs. Tackley's father, Lorenzo Delong, and his wife, Nancy (Fargo) Delong, were natives of New York, where their entire lives were spent. Mr. Delong died in 1875 and his wife in 1881. Mrs. Tackley has a brother and two sisters living in New York. She is now serving as postmistress at Lillian, having been appointed to this office in 1907. The gentleman above mentioned is counted among the oldest settlers of Knox county, Nebraska. Since locating here in 1883, he has taken a foremost part in the development of this region, and has built up a good home and farm in section twenty-six, township thirty-one, range three. mine for six years, then going to LaSalle, Illinois, mining there seven years, until 1883. In 1883, Mr. Joll came to Knox county, Nebraska, where he took up a homestead in sections twenty-seven and twenty-eight, township thirty-one, range seven, which he greatly improved. Later he bought eighty acres of land from J. T. Linsey, which he also improved, and out of which he has made a fine home for himself and family, and where he now lives. Mr. Joll, like so many of the earlier settlers of this western region, experienced a great many hardships and disappointments in the pioneer days, and as late as 1900 lost all his crops through the hailstorms of that season. But Mr. Joll has stuck to his faith in Nebraska soil and her natural resources, and has been well repaid for his faithfulness. In 1881, Mr. Joll was united in marriage to Miss Mary Taylor, and Mr. and Mrs. Joll are the parents of three children, whose names are as follows: Maude, Ella, and Ethel. Mr. and Mrs. Joll and family are highly esteemed and respected by all who know them, and in their pleasant home are surrounded by a host of congenial friends and acquaintances. One of the typical pioneers of northeastern Nebraska is the gentleman named above, John Greenwald. He is one of the earlier settlers of Wayne county, and can relate many of the pioneer experiences of the settlers of this locality, who braved the hardships and privations and became permanent settlers and prosperous farmers. He has succeeded in building up a good home and has gained the confidence and esteem of a large circle of acquaintances. Mr. Greenwald is a native of Hesse-Armstadt, Germany, and was born in 1840. His parents, Conrad and Barbara Greenwald, were small farmers. The subscriber's early years were spent in his native land, where he received his education. In 1862, Mr. Greenwald came to America, as so many thousands of his countrymen have come since, to seek his fortune in the land of opportunity. He went from Baltimore directly to Pennsylvania, and from there to Cincinnati, Ohio, then to St. Louis, Missouri, and from the latter place to Pekin, Tazewell county, Illinois, where he remained about ten years, working at the trade of blacksmith, which he had learned in his native country. On. account of his health, he decided to stop working at his trade and come farther west. In 1875 he accordingly came to Wayne county, Nebraska, and bought what was known as the "George Graves Place" of three hundred and twenty acres. Since purchasing this homestead, he has made many extensive improvements, not the least of which is the planting of a fine orchard of five acres or so, which is now in its prime. He has prospered, in spite of the many discouragements which fell to his lot during the early years of pioneer life, when grasshoppers, prairie fires, and blizzards all seemed to conspire to make the settler's life a burden. He now has a comfortable home, and a good farm, the very appearance of which indicates thrift and good management. In 1868, Mr. Greenwald was married to Miss Pauline Weiland, of Tazewell. They are the parents of seven children, upon whom they have bestowed the following names: Lewie, John, Pauline, Lizzie, Annie, Matilda, and Phillip. Mr. and Mrs. Greenwald are members of the German Lutheran church, and Mr. Greenwald is a democrat although not party bound, voting for the men he considers best qualified for office. In reviewing the history of eastern Nebraska, the citizens who have contributed to her welfare must be given special mention, and a prominent place among this number is given to the venerable gentleman above named. Mr. Scherzberg is a pioneer settler, and is perhaps one of the best known men of his locality. He was born in Fuerstendurhm, Sondershausen, Gold Valley, Germany, December 26, 1837. His parents were also natives of Germany. In 1858 Mr. Scherzberg came to America, locating in Michigan, where he followed the occupation of farming; then going into Iowa in 1864, then into South Dakota, where he remained three months, when he returned to Iowa, and was engaged in railroading for the northwestern railroad. In 1866 Mr. Scherzberg, came to Nebraska to follow railroading, and was one of the locators of Grand Island. He came to Merrick county in 1866. In the summer of 1872, Mr. Scherzberg was married to Miss Lizzie Clumke, who was also born in Germany, and came to America in 1872. Four children were born of this union: Ellen, wife of D. Knightfield, has eight children and lives in Merrick county; Arthur, who resides in Nebraska; Carl, married, has five children, and lives in Hall county; and an infant, deceased. Mrs. Scherzberg died February 29, 1880. Mr. Scherzberg has been prosperous and successful and owns two hundred and eighty acres, which is used as a stock and grain farm. He has acted as road supervisor some years, which office he has filled to the entire satisfaction of the people, and with credit to himself. On October 14, 1880, Mr. Scherzberg was married to Augusta Popblke, a native of Prussia. Three children were born of this union: Alfred, who resides in Loup county, Nebraska; Walter, married, has three children, and lives in Merrick county; and Oscar, who resides at home. Mr. Scherzberg is one of the early settlers of the county, and is widely and favorably known. He lives on section ten, township eleven, range eight; his postoffice address being Grand Island, Nebraska, rural free delivery, number four.